The league leaders are nine points clear at the summit and they will be keen to continue their momentum as we approach the halfway point in the season. Seb Reynolds’ men come up against a Clifton side who have won their last two games so it won’t be a simple task at Old Bath Road on Saturday. Second-placed Canterbury have their sights set on maintaining their own excellent form when they travel to Bury St Edmunds while fellow promotion candidates Henley Hawks visit Guernsey. The aforementioned Guernsey currently occupy a spot in the bottom three with relegation rivals Birmingham and Solihull taking the trip to Barnes this weekend while London Irish Wild Geese face Old Albanian and Old Redcliffians entertain Worthing Raiders. Elsewhere, Tonbridge Juddians welcome Redruth to the Slade and Taunton Titans go to Dings Crusaders. Rams RFC rolled on in Round 13 as their ninth consecutive victory kept them out in front in National Two South. Head coach Seb Reynolds paid tribute to the hard work of his side as they came away from Redruth with an excellent win which leaves them nine points clear at the summit of the division. Their trip to Cornwall was arguably their toughest fixture in the lead up to Christmas, but the Rams won’t be taking Clifton lightly at Old Bath Road this weekend. Matt Salter’s side arrive in Berkshire on a high as back to back wins against Bury St Edmunds and Barnes has reignited their campaign. The Lavender and Blacks are now 12 points clear of danger and a victory at the home of the league leaders would not only continue that winning feeling, but it would also be the result of the season so far. Last weekend, Canterbury made it six wins in a row as they saw off a strong Old Albanian side to remain in second spot in National Two South. The City Men have not suffered a defeat for just under two months and Andy Pratt’s side are showing no signs of halting their momentum as we approach the halfway point in the season. Next on the agenda for the Kent-outfit is a trip to Bury St Edmunds and the hosts will certainly be in a positive mood heading into Round 14. Nick Wakley secured his first win as Bury boss last Saturday as the Wolfpack defeated Birmingham and Solihull and since he has arrived in Suffolk, there has already been an improvement in results having picked up eight points from their last three games. Bury have won just twice at home all term so can they burst the Canterbury bubble to continue their mini resurgence? After dropping out of the top two places following a defeat to Canterbury in Round 12, Henley Hawks responded immediately last week by beating London Irish Wild Geese. Nigel Dudding’s side have now won eight of their last nine games and they still remain firmly in the promotion race as they prepare to face another relegation-threatened side on Saturday. Henley take the trip to Guernsey with the hosts currently occupying a spot in the bottom three. Jordan Reynolds’ side have lost seven on the spin, but they are only one point adrift of safety heading into this weekend. The Raiders’ last win came over two months ago at Footes Lane against Clifton so they will be keen for another home triumph this weekend as the side competing in National Two South for the first time this season, aims to move out of trouble. Following a winless November, Taunton Titans kicked off this month in style as an excellent second half display saw them defeat Old Redcliffians in Round 13. Tony Yapp’s side got their season back on track at the Commsplus Stadium and the Titans moved back up to fourth place following the victory. The Somerset outfit are now seven points off second-placed Canterbury and they will be hoping to keep the City Men in their sights by gaining a positive result this weekend. However, Dings Crusaders will be out to build on their own recent victories. Luke Arscott’s men have defeated Old Redcliffians and Guernsey over the last two weeks and the side who gained promotion back in April are now sitting comfortably in the top half of this division. The Crusaders are having a really solid season and they will be eager for that to continue when Taunton travel to Shaftesbury Park on Saturday. Last season, Redruth and Tonbridge Juddians finished in fifth and sixth place, respectively, and both sides find themselves in similar positions as the teams meet at the Slade this weekend. TJs currently occupy fifth spot and Peter Dankert’s side are currently on a five-match unbeaten run following their draw with Worthing Raiders in Round 13. TJs would have been frustrated not to have grabbed the win at Roundstone Lane as they are now eight points off the top two, but they can continue their good form against Redruth this Saturday. The Reds are seventh as things stand, but they began December with a home defeat against the league leaders Rams RFC. It was always going to be a difficult fixture for Pale Nonu’s side so they will be hoping to respond immediately by securing back to back away wins in Kent this weekend. Old Albanian’s four-game winning streak came to halt in Round 13 as Gavin Hogg’s side were beaten by second placed Canterbury at the Marine Travel Ground. 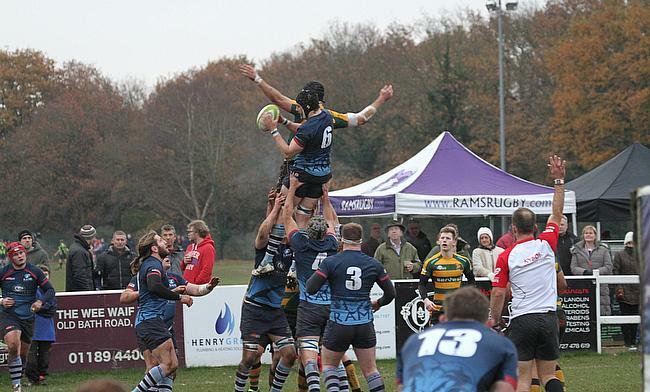 OAs had been enjoying their best run of form since their relegation back down to National Two South, so the sixth-placed side will be aiming for an instant reaction when they host London Irish Wild Geese this weekend. As thing stand, the Wild Geese travel to Woollams in the bottom three. After defeating Guernsey at the end of November, they kicked off this month with a home defeat against promotion chasing Henley Hawks and they are now two points from safety as the halfway point in the season comes into view. The Hazelwood outfit have avoided the drop in each of the last two campaigns and a third away victory of the term would certainly enhance their current survival bid. Barnes’ run of five straight victories came to an end in Round 12 when they lost narrowly to Redruth, but they couldn’t return to winning ways on the first weekend in December as they fell to a 44-24 defeat away at Clifton. The London-based side dropped down to ninth place following the result last Saturday, but they may feel like they have a great opportunity to halt this mini-blip in form when they host Birmingham and Solihull this weekend. The visitors take the trip south aiming to stop their own dip in results. Pete Glackin’s side are currently at the foot of the table following three straight defeats against Henley Hawks, Old Albanian and Bury St Edumunds, but the Midlands outfit are just six points from safety. It is far from disastrous for Birmingham & Solihull and a win against a team which was promoted alongside the Bees would be the ideal result especially with a fixture against league leaders Rams RFC on the horizon. Worthing Raiders may have had contrasting thoughts after their draw with Tonbridge Juddians last week. Jody Levett’s side, who are currently suffering from a number of injuries, led at half-time against the TJs, but then they had to rely on a superb penalty from Matt McLean to claim a share of the spoils at Roundstone Lane. It is now just one win from their last six games for the Raiders, but in Round 14, the 10th placed side take on an Old Redcliffians outfit which is embroiled in a relegation battle. Despite an impressive first half display at Taunton Titans last Saturday, Old Reds fell to a 49-17 defeat which leaves them one point clear of the drop. The men from Scotland Lane have picked up just one victory since the end of September so Saul Nelson’s side will be eager to taste that winning feeling again as they look to distance themselves from danger.